Q. How do I arrange for service? A. Just call or email us We set up an appointment for a free in-home/office estimate. A representative from our office will visit each room and explain the tasks that are normally completed. Your special requirements are noted so that we can tailor a package precisely to your preferences. Q. Why does the initial cleaning cost more? A. It usually takes us longer to clean the house the first time because there maybe areas of the home that we will be cleaning that have not been cleaned recently. Q. Do I need to do anything before the cleaners arrive? A. In order for the cleaners to do their job, we ask that you pick up clothing, toys and other household items. The cleaners will not know personal items belong and we prefer that they not open your closets or where your drawers to put things away. Q. Is it okay to leave instructions on a note? A. Of course it is! We believe that good communication is crucial to maintaining a good business relationship. We welcome and invite all feedback. A. We normally work in teams of two, but the size and condition of your home will determine the number of staff that we will assign to service your home. In certain cases, we will assign a single house cleaner. Q. What if I find a problem with the service? A. Every cleaning carries a 100% satisfaction guarantee. If you are not satisfied, a cleaner will return to your home and address the issue. Q. What if I need to skip a cleaning? whichever is greater. 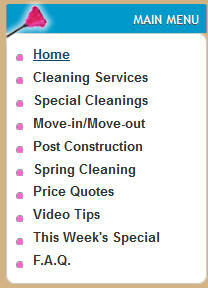 Repeatedly skipping your scheduled cleanings will result termination of service. A. Pets are not a problem. We do need to know if you have them and we would like to have their names for reference. If you have large and/or aggressive pets we ask that you secure them while we are cleaning your home.